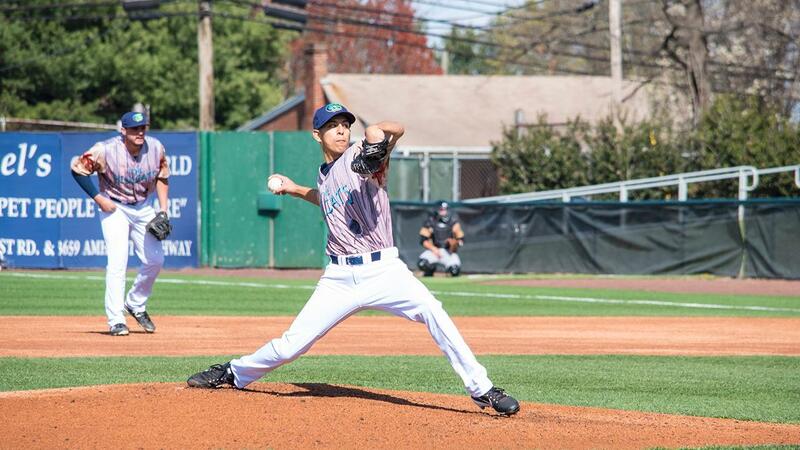 Kinston, N.C. - The Lynchburg Hillcats mustered just six hits in a 8-0 loss to the Down East Wood Ducks on Sunday afternoon. Lynchburg (7-4) surrendered five third inning runs to Down East (7-4) to dig themselves in an early hole. In the home half of the third, Diosbel Arias led off the inning with a double. Two batters later with one out, Yonny Hernandez walked to put two aboard. Bubba Thompson then followed with an RBI single to score Arias, getting Down East on the board for a 1-0 lead. Leody Tavares was up next and pushed an RBI bunt single down the first base line to score Hernandez for a 2-0 lead. After Tavares was picked off of second base for the second out, Anderson Tejeda blasted a two-run home run off the scoreboard in right-center field, extending the Woodies lead to 4-0. Following the blast, Tyreque Reed doubled and scored on a Yohel Pozo RBI single for a 5-0 advantage. Leading off the bottom of the fifth, Tejeda crushed his second home run of the game, this time to left-center to give Down East a 6-0 edge. The Wood Ducks rallied for two more runs in the eighth inning. Arias and Ryan Dorrow hit back-to-back singles to start the inning. Then with one out, Bubba Thompson hit a swinging bunt back to Anderson Polanco , who committed an error by throwing wide of first base, which allowed both Arias and Dorrow to touch home plate to cap the scoring. Justin Garza (Loss, 1-2) allowed six earned runs on seven hits in five innings. He walked three and struck out four. Polanco allowed two unearned runs in three innings in relief. Garza has now given up 12 runs on 16 hits over his last 8.1 innings pitched. Noah Bremer (Win, 1-0) tossed five scoreless innings for Down East, striking out two. Francisco Villegas fired three shut out innings out of the bullpen and Peter Fairbanks closed it out with a 1-2-3 ninth. With Sunday's loss, Lynchburg has now suffered back-to-back defeats for the first time in 2019. 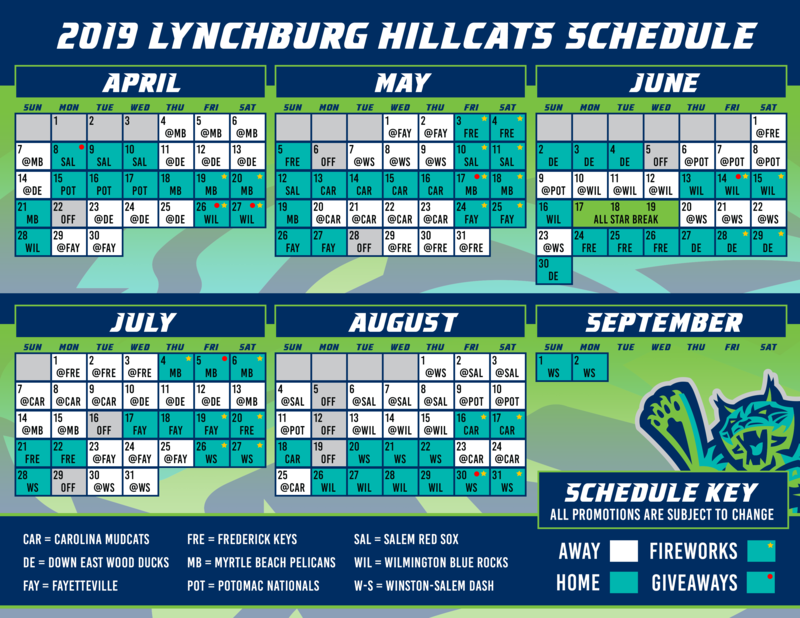 The Hillcats will now return to City Stadium to begin a seven-game home stand on Monday night against the Potomac Nationals. Left-hander Adam Scott (1-0, 3.60 ERA) will toe the slab for Lynchburg in the opener against P-Nats right-hander Luis Reyes (0-1, 12.46). First pitch is scheduled for 6:30 p.m.
Max Gun and Anders Jorstad will be on the air beginning at 6:20 p.m. on TuneIn Radio and Radio434.